“We used to own a small piece of infertile land. To make ends meet for our family of seven, my husband and I started collecting firewood and fruits from the nearby forest, and selling it at a local market. Over time, unchecked deforestation turned the forest barren too, forcing us to migrate to Gujarat to earn a living,” narrated the 35-year-old Sawdi Bai living in a remote village in Alirajpur District, Madhya Pradesh. However, soon, her life was going to be transformed, for the better! As part of its intervention in villages across Alirajpur, ActionAid India – along with Dhas Gramin Vikas Kendram (DGVK) and a strong community-based forum formed with support from DGVK, namely Khedut Mazdoor Chetna Sangath (KMCS) – started generating awareness among community members on sustainable agriculture and indigenous crops, factoring in the local ecology and climate. 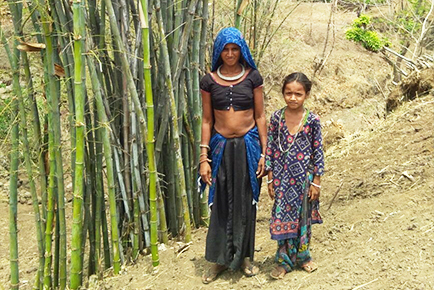 “KMCS and ActionAid India advised us to plant and rejuvenate bamboos in our forest. We started growing bamboos. And amazingly, after five years of nurture, we now have a bamboo forest in our village, spreading over nearly 1,200 acres,” said Sawdi. Now that a bamboo forest stands there, the villagers harvest the matured bamboo and sell it to the Bamboo Traders’ Society and earn a good profit. “Thanks to the profit we earned, I could repair my hut. It also enabled us to improve our agriculture, besides adding nutrition to the family’s diet. I am happy that we do not have to migrate anymore and that our children are able to continue their education,” she added. KMCS and ActionAid India have facilitated the revival of forests in 20 villages across Alirajpur. Community members are also being trained and encouraged to grow sustainable, climate-friendly fruit, medicinal and firewood plants. Communities are now protecting their forests; migration from the villages has reduced to a large extent and children are now getting continued education and good nutrition.